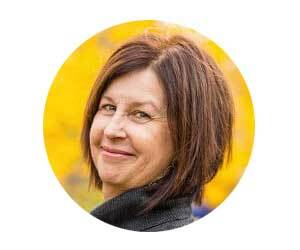 Things that go bump in the night; isn’t that what makes Halloween so chillingly fun? Well, fear of them really. 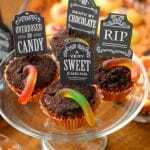 There are so many creepy creations for Halloween parties on the internet there is no excuse for not throwing a ghoulish bash! When I was in fourth grade I hosted some friends at my house for a Halloween party. We moved the car from our small garage, decorated in orange and black and set up some traditional games like bobbing for apples, which as a kid we loved. Now of course everyone is a germaphobe and would never consider dipping multiple sinus cavities in a mutual bucket of water during cold season attempting to bite a fruit someone else already may have had in their mouth. We knew no better back then, thankfully. After all the games were played we decided to have a séance. How I knew about them I have no idea but it seemed exciting. We all sat in a circle holding hands, saying whatever one does at a séance, beckoning a spirit passed to visit us. I kid you not, we all jumped when we heard a loud ‘thud’ at the small window on the side of the garage. Then the screaming started….my Siamese cat, Rama, had decided it was a perfect time to jump up onto the ledge of the window outside. It seemed completely auspicious as he’d never done it before. That was the end of the now hysterical, Halloween party. 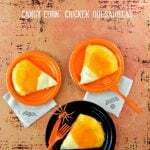 I love creating new, fun Halloween recipes every year, never loving a repeat. 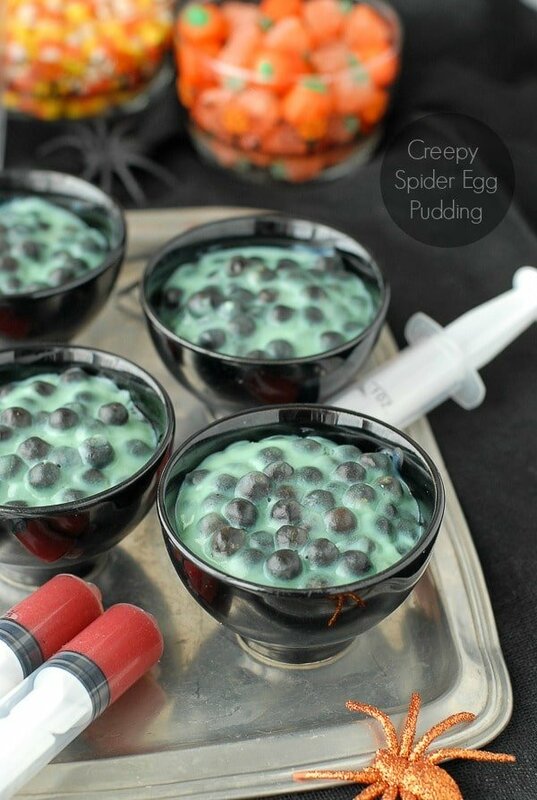 I’m unsure how I landed at this Creepy Spider Egg Pudding but I could not wait to make it. Truth be told, I think it sprang from a find at the local Halloween Superstore when trying to put together a Greek mythology costume for my son’s English class. I spied the shot syringes and had to find something to make to use them. (A bit like buying a pair of shoes then figuring out the outfit to go with it). Something ghoulish, but not totally gross. 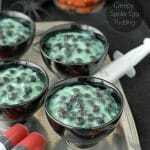 Creepy Spider Egg Pudding is actually a riff on a traditional Tapioca pudding though made with Boba, the large black tapioca pearls found in Bubble Tea. It can be found readily at Asian grocery stores, Whole Food most likely or online. It is prepared like instant tapioca (a staple of my childhood) as Boba cooks in 5 minutes. Boba has a chewy consistency making the pudding all the more fun and unexpected. 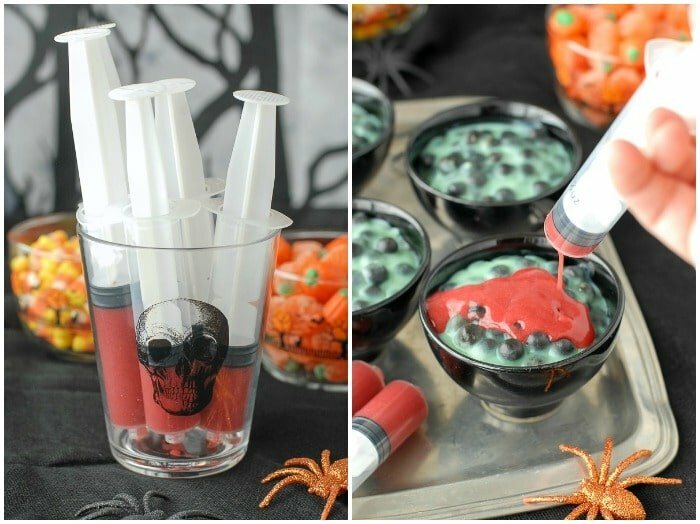 A simple strawberry-raspberry puree fills the syringes for a topping that guests will never forget! 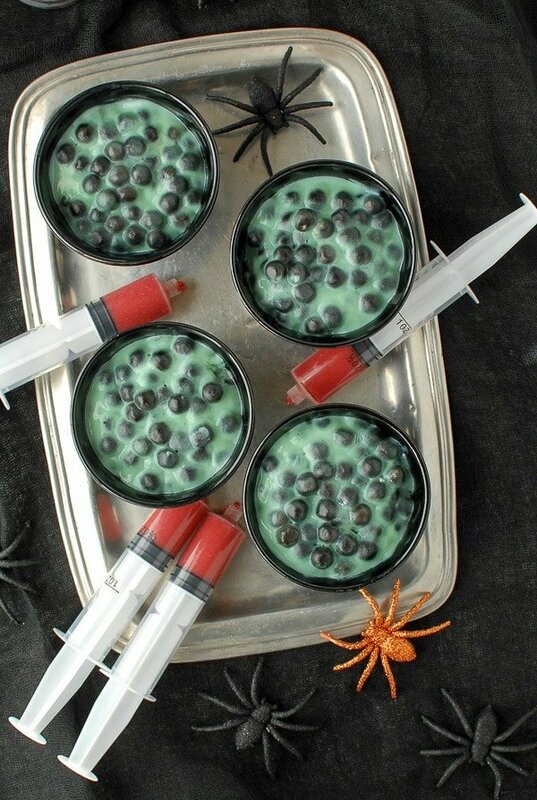 It tastes delicious with the pudding and who doesn’t love the idea of dressing their own pudding with a fake syringe making it look like the pudding is bleeding?! 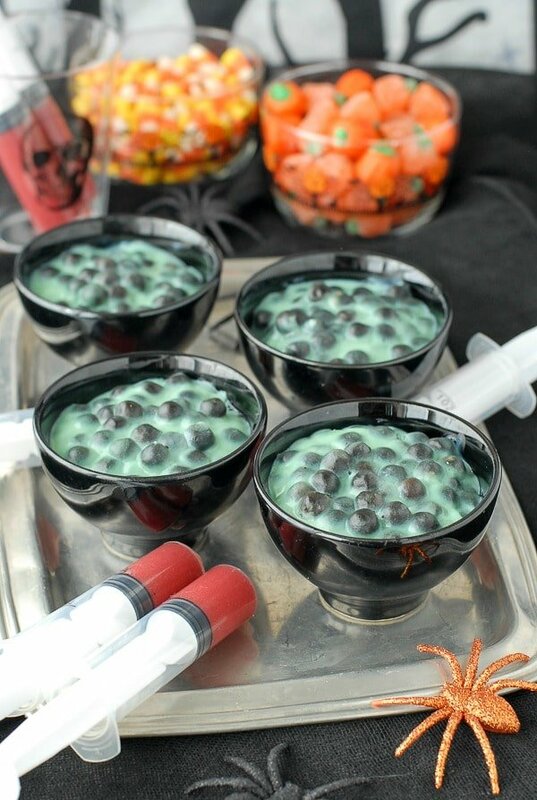 Halloween begs for ghoulish recipes and Creepy Spider Egg Pudding hits the mark. 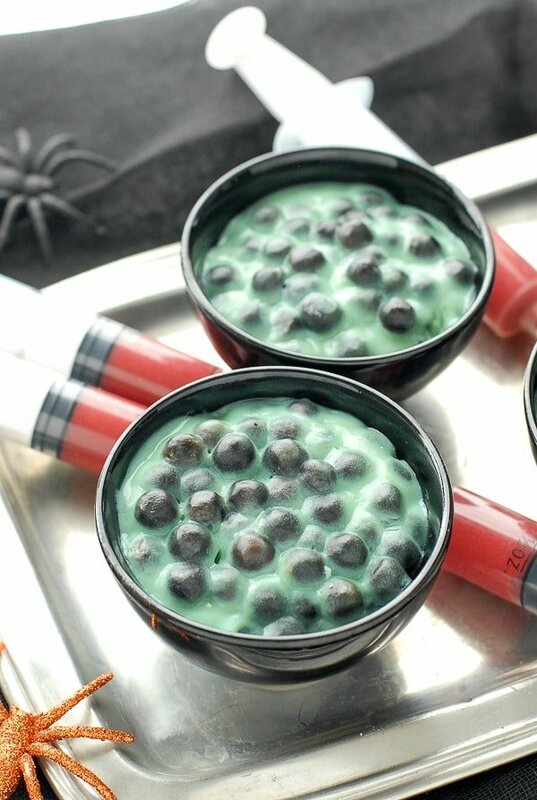 A version of tapioca pudding using Boba (large tapioca pearls found in Bubble Tea) swimming in green-tinted pudding will garnish any spooky menu with panache. 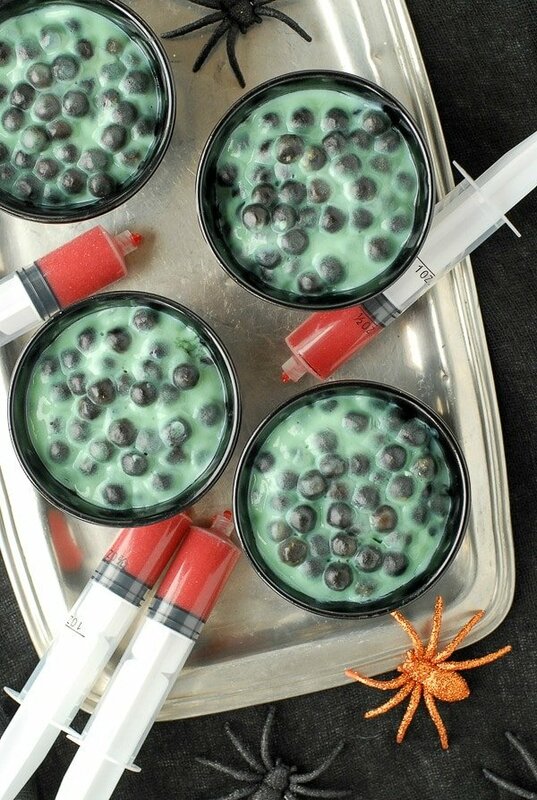 Only made better with shot syringes filled with a berry puree that when added to the top of the pudding makes it appear it might be bleeding!Unlike smaller tapioca pearls Boba is chewy by nature and therefore the pudding is as well. To achieve the effect of the egg nest equal parts of milk and Boba are used making the pudding mainly Boba pearls. 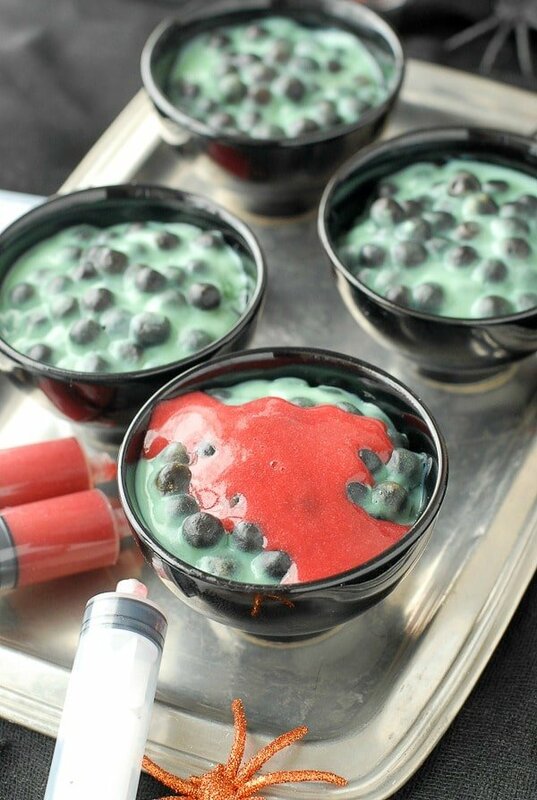 Should you desire a creamier effect with more pudding, reduce the Boba by 1/2 cup and increase the milk by 1/2 cup, following the same recipe steps.The pudding has the best appearance when chilled in individual containers. May be served warm or chilled. 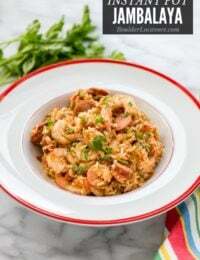 Select individual serving containers and have them ready by the stove top. In a medium sauce pan, combine the sugar, boba, milk and egg. Stir to full combine and allow to sit with no heat for 5 minutes. Over medium heat allow the mixture to come to a low boil while stirring constantly (5-7 minutes). The mixture will thicken slightly as it become hotter and will thicken fully as it cools. 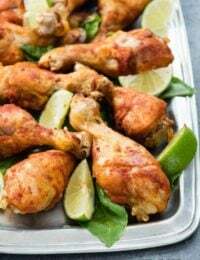 Remove from heat and stir in the vanilla extract and green food coloring (if using). Spoon the pudding mixture into the containers and cover lightly with plastic wrap, tenting it in the middle so it is not touching the top of the pudding (Press and Seal wrap is great for this). 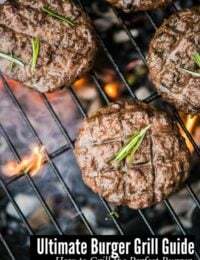 Place in the refrigerator to fully set. May be served cold or at room temperature. Place a fine mesh sieve over a small mixing bowl. 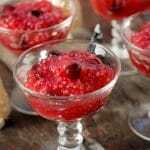 Combine the thawed berries and the sugar in a blender (or food processor) and blend to fully puree. 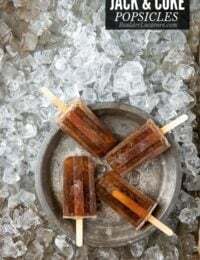 Taste and add more sugar if needed. Pour the blended mixture through the sieve, pressing it with a spoon to allow all the liquid to pass through. Scrape the underside of the sieve as well. To fill the syringes: Place the end of a syringe into the puree and pull the plunger up to fill; ½ ounce is a good amount for the topping. 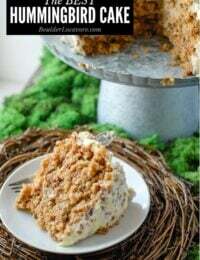 The topping may also be spooned onto the pudding if not using syringes. 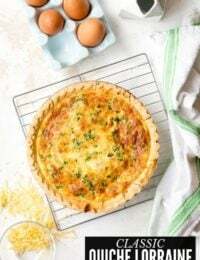 Yep, I could eat that! I’ve never heard of boba so now I’m intrigued. It’s fun to run into something this unique. Super creepy!!!!!! And they look pretty delicious, as well. I personally love the bowls of candy corn hiding in the back … my favorite candy of the Halloween season. Thank you for this advance creep-out to get in the mood ……. ooooooooooohhhhhhh!